practice before judges, arbitrators, and administrative officials. 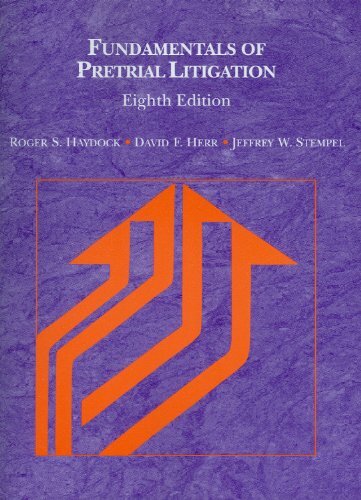 The extensive text provides examples and illustrations of successful litigators New materials include the most recent revisions To The federal rules of civil procedure, The latest developments relating to electronically stored information, novel methods to discover emails and social network communications, updated practice procedures, and innovative approaches to modern pretrial litigation. A hallmark of the book is the inclusion of problems after each chapter and a variety of civil case files. The materials introduce students To The legal theories and rule policies. The exercises have students experience the pleadings, The discovery, And The motions of pretrial practice. organizations as The Federalist Society, Manhattan Institute and Washington Legal Foundation. Mr. Maniloff is a frequent lecturer at industry seminars and has been quoted on insurance coverage topics by such media as: The Wall Street Journal , The New York Times , USA Today , Dow Jones Newswires , The Philadelphia Inquirer , The Times-Picayune , and The National Law Journal . Jeffrey W. Stempel is the Doris S. and Theodore B. Lee Professor of Law at the William S. Boyd School of Law at the University of Nevada, Las Vegas. Stempel is a 1981 graduate of Yale Law School, where he was an editor of the Yale Law Journal and co-founder of the Yale Law and Policy Review . He spent two years as a law clerk to a federal district court judge in Philadelphia and three years in private practice with a firm in Minneapolis before entering the teaching profession. He is the author of Stempel on Insurance Contracts , a practitioner-oriented treatise.